In the fall of 2015, I was offered the opportunity to propose an exhibition for the Missoula Art Museum. 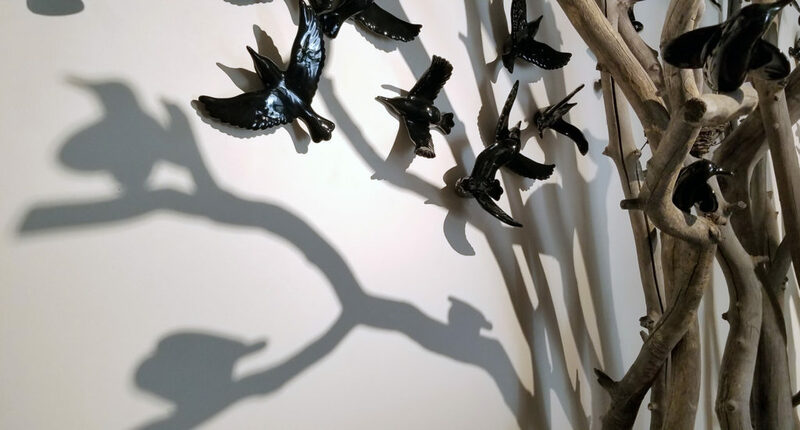 Between the spring of 2016 and fall of 2018, I created a large built-environment and ceramic bird installation for an exhibit entitled Understory/Overstory. It was on display in the Museum’s Aresty Gallery from August 23, 2018 Through Jan 12, 2019. Another iteration of the exhibition is scheduled at the Holter Museum of Art from July 5 through December 31, 2019. I have been making hundreds of ceramic birds each year for the last ten years. What has evolved from this process is a formal expression of the “bird” concept that is not species-specific but archetypal. 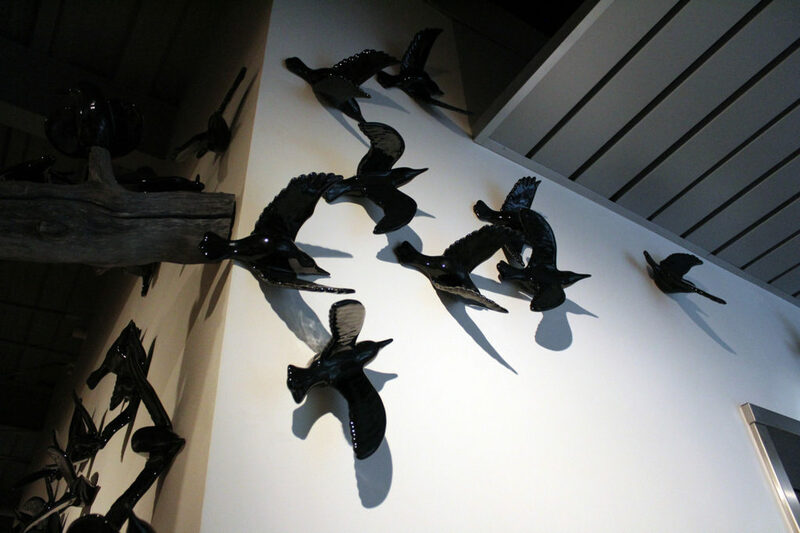 As objects, birds serve as metaphors for a wide range of human needs and emotions: aspiration and serenity, nesting and flight, fragility and freedom, community and solitude. We read desire in wishbones, rebirth in eggs, and nostalgia in birdsong. 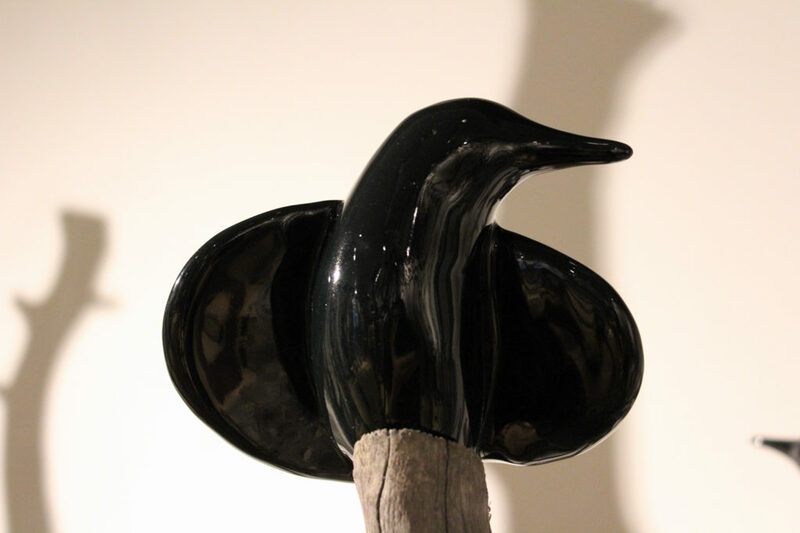 Each of my ceramic birds is a glazed surface inviting individual interpretation and meditation. The museum has produced a beautiful catalog for this show including an essay written by Brandon Reintjes. A 360 degree view of Understory/Overstory made by Slikati Photo and Video is here. An additional two minute video walkthrough of the installation can be viewed here. 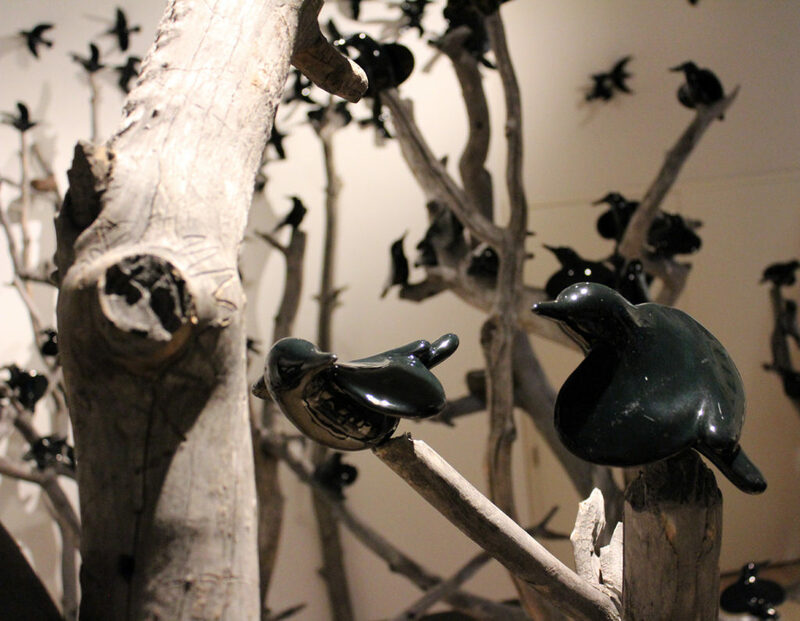 Photos from the bird installation at the Missoula Art Museum in the fall of 2018. The 1929 Migratory Bird Act prohibits the use of most bird-related biological artifacts. These settings are not intended to be representational. Rather, as extensions of the metaphorical approach to birds, nests, and trees function as symbolic “canvases” for the viewer’s ideas.